Photo by Mike Graeme, Senior Staff Writer. 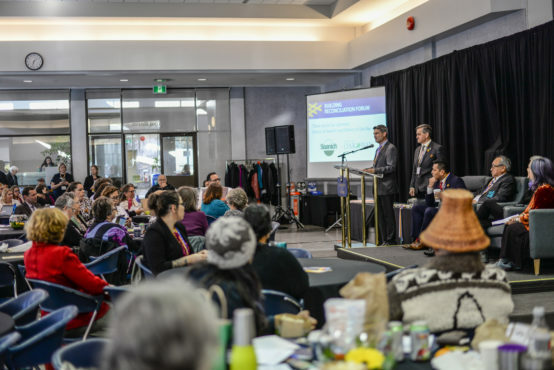 Nearly 250 leading thinkers from universities, federal and regional governments, and Indigenous communities and governing bodies came from across Canada to participate in the fourth Building Reconciliation Forum hosted by UVic on Nov. 15 and 16. The annual forum, hosted in partnership with Universities Canada, allows universities to reflect on how they are responding to the Truth and Reconciliation Commission’s Calls to Action. The TRC’s Calls to Action demand for reconciliatory acts that redress the legacy of residential schools. They centre on the areas of child welfare, language and culture, health, education, and justice, and are directed especially at federal, provincial, territorial, and Aboriginal governments, as well as post-secondary institutions. “The theme of this year’s forum is Ts’its’u’ watul [tseep]. 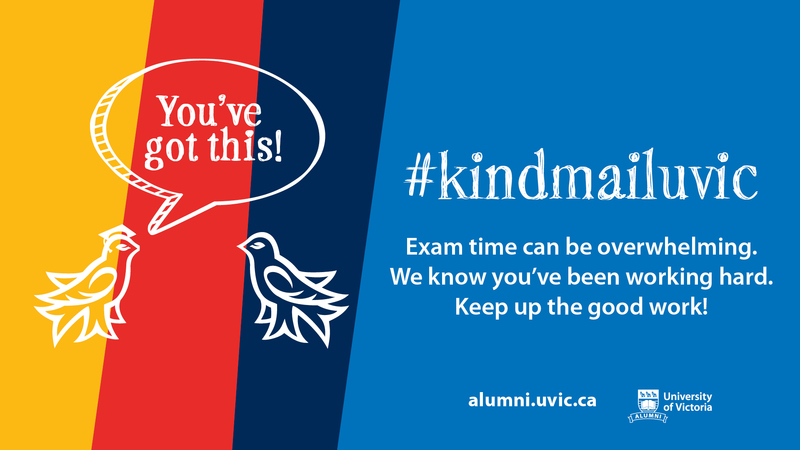 That is, I am told, how we work together, how we help one another,” said UVic President Jamie Cassels during his opening speech. Rick Colbourne, member of the Mattawa/North Bay Algonquin First Nation in Ontario has been a part of this systemic change happening in universities across Canada, and was one of the event’s panel speakers. Colbourne said that universities have a responsibility to allow Indigenous communities to become empowered on their own terms and by their own values. He added that there is still a lot of work to be done though, especially in the faculty of business. “We’re teaching business, entrepreneurialism, economic development, [but] … we risk recolonizing and re-assimilating our students,” he said. While business and other university programs run this risk, many initiatives are heeding the TRC’s Call to Action and working to decolonize university syllabi across all faculties. Indigenous artist and carver Lianna Spence of Lax Kw’alaams, who spoke on the same panel as Colbourne, shared her personal success story of empowerment which occurred during her time in UVic’s Aboriginal Canadian Entrepreneurs (ACE) program. The tuition-free ACE program connects business and culture, helping Indigenous students learn how to lead and operate their own companies. Since participating in the ACE program, Spence doubled her annual income as a carver before starting a tattoo venture, which has increased her income another threefold. But the most important part of Spence’s education has been the opportunity to give her culture resilience. “All carvers that I know are very humble [and] they’re very cultural, but when you take that business component and put it together, you’re more than just a carver. You’re changing lives and you’re uplifting the culture at a faster rate than you would if you didn’t take something like the ACE program,” she said. The ACE program inspired Spence to host her first feast and raise the first totem pole in her community in over a hundred years. She did this in memory of her mother. The Building Reconciliation Forum celebrated the ACE program, as well as UVic’s new Indigenous law program — but the forum speakers also said there needs to be more programs like this. Prime Minister Justin Trudeau was unable to attend the forum in person, but he did send his sentiments through a video screened at the forum opening, speaking highly of the Indigenous law program. “I want to salute the important work UVic is doing to advance reconciliation, including your recent historic launch of the world’s first Indigenous law program,” he said. Cassels said that a big success at UVic is the sheer number of Indigenous students attending UVic, which has tripled over the past 10 to 12 years. But UVic student Hayle Gallup of the Tahltan First Nation told the panel that “reconciliation at the university level does not only involve increasing the Indigenous population on campus.” Reconciliation is about non-Indigenous students as well, she said. Institutions need to give space and provide opportunities for non-Indigenous students to participate in dialogue and take everyday action for reconciliation, she continued. Cassels also emphasized the need for dialogue between Indigenous and non-Indigenous people. “We have to create a space … where it is safe … to have extraordinarily uncomfortable conversations,” he said. Cassels added that reconciliation in big institutions like universities can be slow, and that they have to be careful not to bite off more than they can chew. Forum discussions will be soon be compiled and published as an open-access report.